Now it’s time to show your stuff and become a Three Chord Bourbon Ambassador. Bourbon Ambassador Certificate and T-shirt. Thank you…start striking the Three Chord with your friends. Three Chord Blended Bourbon is a blend of up to 12-year-old barreled bourbon, selected from the three premier bourbon producing regions in the country; Kentucky, Tennessee and Indiana. Just as in music, the Three Chord Progression I, IV, V blend together, in harmony to make a great song, each bourbon contributes a different characteristic to the final product. We blend them using our proprietary filtration and secondary wood charring process to create a balanced bourbon. Three bourbons perfectly tuned together to taste greater together than alone….greater than the sum of its parts. Blended to a “Perfectly Tuned Taste”! Our bourbon is well balanced and can be mixed in cocktails, Highballs and the Bourbon Smash (mixed with lemonade and a splash of sprite). The Twelve- Bar Blues is one of the most prominent chord progressions in popular music. 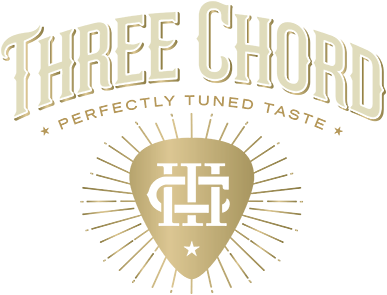 Like the blues progression, Three Chord’s straight bourbon has a distinctive flavor. Just as the progression has unique rhythm, chord structure and duration, Twelve Bar Reserve has a distinctive flavor, smooth character and refined taste. A blend of Kentucky and Tennessee 12 year old Bourbons. Each offering its own character to complement each other. They were born and matured in bourbon country and they ventured to Michigan to join in harmony! Blended to a “Perfectly Tuned Taste”! Perfectly Tuned from two different Ryes from Kentucky and Indiana. Our Rye blend averages 14 months old. Our mash bill is 95% Rye, 5% malted barley. We are bottled at 95%. We use the best aged White American Oak staves from the Ozarks in Missouri at the Independent Stave Company. We selected a cooperage to assemble our barrels in Louisville, Kentucky that has 55 years of time-tested coopering techniques. All Three Chord Bourbons are aged in Number 4 Char (Alligator-55-second burn) barrels. We filter our water through reverse osmosis, one-micron filter that creates the cleanest, purest water possible. The longer whiskey ages, the more the wood takes over the flavor profile. Our secondary, controlled, wood-charring process reintroduces compounds that create the maple syrup, caramel and vanilla character that consumers love. This secondary char is light, called a “toast”. * Our 12-year-old whiskey in the blend helps create that smooth, refined finish. * Our process creates a bourbon of defined balance. Three Chord Bourbon’s nose of maple syrup and vanilla gives way to a pleasing spice featuring dried citrus with a smooth, refined finish and just a mild “hug”! * Bourbon must be made in the United States. It does not have to be made in Kentucky. * Bourbon’s grain mix (mash bill) must be made from at least 51% corn. Other commonly used grains are rye, wheat and barley. * Distilled to no more than 160 proof. * Aged at least three months in new charred oak containers (barrel). * Enters the container (barrel) at no more than 125 proof. * Bottled at 80 proof or more. * Straight bourbon must be aged a minimum of two years. * Any bourbon aged below four years must have an age statement on the bottle. * Most distillers believe about 60% plus of the flavor and 100% of bourbon’s color comes from the wood. * Over its lifetime in the barrel, up to three gallons of whiskey can soak into the wood staves of the barrel, this is the “Devil’s Cut”. * Alcohol evaporates at about 172 degrees and water evaporates at about 212 degrees. * The barrel’s higher in the Rack House age faster than the barrels at the bottom of the Rack House. * Anywhere from 4%-6% of the whiskey is lost each year due to evaporation – this is called the “Angel’s Share”. * A 50,000 Barrel Rack Households about two million gallons of bourbon. * The standard bourbon barrel holds 53 gallons of whiskey. * Rye whiskeys adhere to the same laws as bourbon, however, they must be at least 51% rye (bourbon must be 51% corn).